According to Corner Creek’s website, its distribution spans 30 states, not including the one in which I reside. That’s why I was surprised to find this limited production Reserve Bourbon in stock at my local liquor store in Virginia. It goes without saying that I couldn’t resist picking up a bottle for a test drive. Corner Creek is distilled in Bardstown, Kentucky, and smoothed with pure limestone water. The blend of wheat, corn, and rye—“a selection of the distillery’s finest barrels”—is then aged for eight years in American oak barrels and packaged in shouldered punt bottles. Notwithstanding its muted copper hue, Corner Creek’s shape and artwork makes it look more like a wine than bourbon. It’s easy to overlook in a store but looks handsome on the shelf. Each bottle (750 ml., 88 proof) sells in the affordable $25-30 range. What makes Corner Creek stand out, according to company marketing materials, is that its Reserve Bourbon is “only lightly filtered so that it retains all its complex flavor in as pure and natural a state as possible.” This strategy will win over bourbon enthusiasts who value a hearty, rustic taste and disappoint others who want more smoothness. 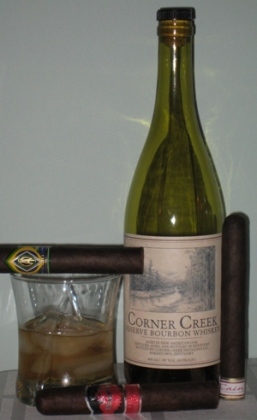 The Corner Creek experience starts innocently enough with a crisp nose of charcoal, sawdust, and banana skin. The first sip, though, carries a distinct smoky flavor with notes of dry steak, syrup, and loads of spice. A bit rough around the edges for my taste. Since this bourbon isn’t necessarily what I’d call refined or elegant, I found myself mixing it up with a splash of Diet Coke instead of drinking it straight or on the rocks. Doing so helps mediate its heavy-hitting character and long, zesty finish. As you might imagine, Corner Creek pairs best with medum- to full-flavored smokes. I enjoyed it with a CAO Brazilia, J.L. Salazar, Punch Champion, and Sam Leccia’s Cain. All of these produced delightful combinations. Still, your degree of satisfaction will vary greatly based on your approach to bourbon. I was neither wowed nor utterly disappointed. That said, it may be awhile before I pick up another bottle of Corner Creek Reserve Bourbon. PS: I find that single malts work better with mild to medium sticks and bourbons with medium to full bodied ones. Rum on the other hand goes well with any stick. What do you think? Thanks for your feedback, Marc. I could see how many would embrace Corner Creek's intensity. But this just ended up being the wrong spirit for me. As for other pairings, yes, rum seems to go nicely with just about any stick. I think some of the more spectacular specimens, though, should be paired with mild- or medium-bodied cigars to allow the user to experience all the nuance and complexity of the spirit. I’ve taken a more trial and error approach with bourbons. If real life was like the TV show "Mad Men" I'd be able to start this important research right away at my desk while doing work…damn you real world and your paychecks! I do agree with you that some aged rums are better suited to milder cigars due to the complexity in the taste. I really enjoy the Spirits reviews you guys do. If you are open to requests I'd love to see some Congac reviews. Also in the rum category a review of Pyrat XO would be cool. Keep up the good work.